Step into the ring, Crystal. The US-based travel company is known for its ocean cruises but has started flying its privately-owned Boeing 777-200LR. The renowned Crystal Experience® introduces an unrivaled new manner of global exploration aboard Crystal Skye, the world’s newest, largest and most spacious luxury jet. Available for private charter for both leisure travel and group events, this lavishly outfitted Boeing 777 has been completely transformed to the highest standards of aviation design, featuring handcrafted, fully-reclining flatbed seats, a dedicated stand-up bar and social lounge, a team of Crystal Skye Butlers and an Executive Chef preparing exceptional Michelin star-inspired cuisine. Additionally, all passengers can take advantage of onboard butlers, a concierge, and toiletries provided by a luxury Italian fashion house. If you want to experience the most luxurious commercial airliner around, you’ll have to fork out at least 46,000 USD. For 46,000 USD, passengers are given a 14-day hop-on-hop-off ticket which works more like an ocean cruise, whereby passengers are given an itinerary and whisked away to a series of destinations. You can also pay more if you want to indulge in the 21 or 28-day itineraries. The excursions will have various themes — including one which flies passengers to Michelin-starred restaurants around the world. Inside, the plane is fitted with just 88 leather seats. Each one reclines into a lie-flat bed and is equipped with a flat screen television and Bose noise-cancelling headphones. Free wifi is also thrown in for good measure. 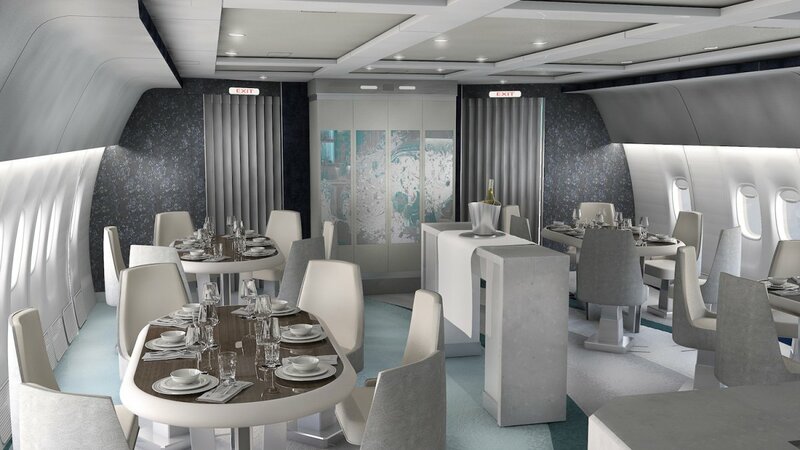 And of course, no luxury airliner would be complete without a Michelin-inspired restaurant in a plush dining room. Passengers will be waited on by a crew of 12 butlers, a lead butler, and an executive chef. A doctor and a concierge will also be onboard. At night, ambient lighting transforms the interior. And at the back of the restaurant, a bar stocked with 300 fine wines is sure to be a welcome addition for nervous flyers. A lounging area is situated towards the rear of the restaurant. Afterwards, guests can refresh in a spacious bathroom stocked with fragrances and toiletries by Italian luxury fashion house Etro. Instead of private cabins, Crystal has opted for a 2-2-2 layout. This is because they expect most passengers will be traveling as a couple.